Chris likes modern, I like farmhouse. 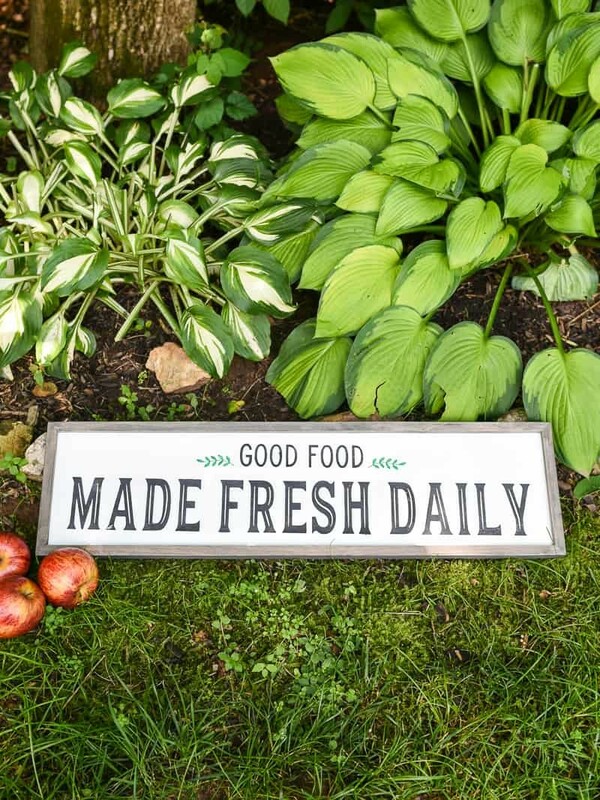 So we compromised with this Modern Farmhouse Kitchen Sign! For years I’ve been dreaming of decorating a house. Getting to put my stamp on it and make it my own. And then, when the time came and we bought our first house, there were…. I looked at all those blank walls, the lack of furniture in the rooms and I was overwhelmed. I was so scared of spending money and making the wrong decision that I just decided to make no decision at all. And so our house sat empty for nine months. Then my mom came up for a visit and gave me a little bit of tough love. I got the whole, “just start buying stuff and return what you don’t like speech” and then she took me shopping. The hardest part about buying stuff for a house is merging two styles. I like the Farmhouse look (which Chris hates) and he likes Modern. And so I was trying to merge the two ideas as I was walking through Home Goods and Target, hoping that Chris would like everything I brought home. He did! Well, most of it. The valances in the kitchen have flowers on them and that’s apparently not something he likes. But they’re staying because there just aren’t any manly valances. Trust me, I looked. Besides those floral valances (which, seriously you guys, aren’t as terrible as Chris thinks), everything I bought was pretty modern. Which I like, but that’s definitely more of Chris’s style. So I decided to run over to Hobby Lobby to get supplies to make a Modern Farmhouse kitchen sign. And you know what? I love it. And I can honestly say it’s one of my favorite things I’ve ever made. 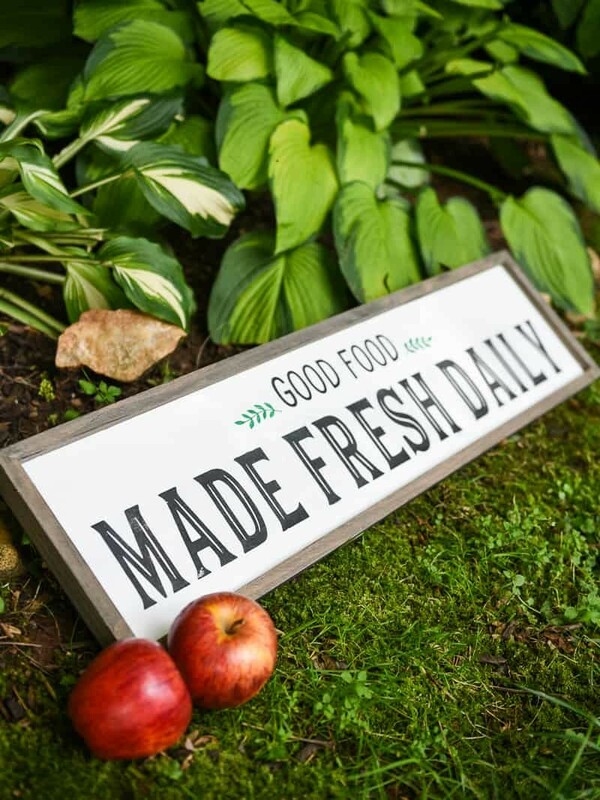 Want to make your own modern farmhouse kitchen sign? It’s so easy! 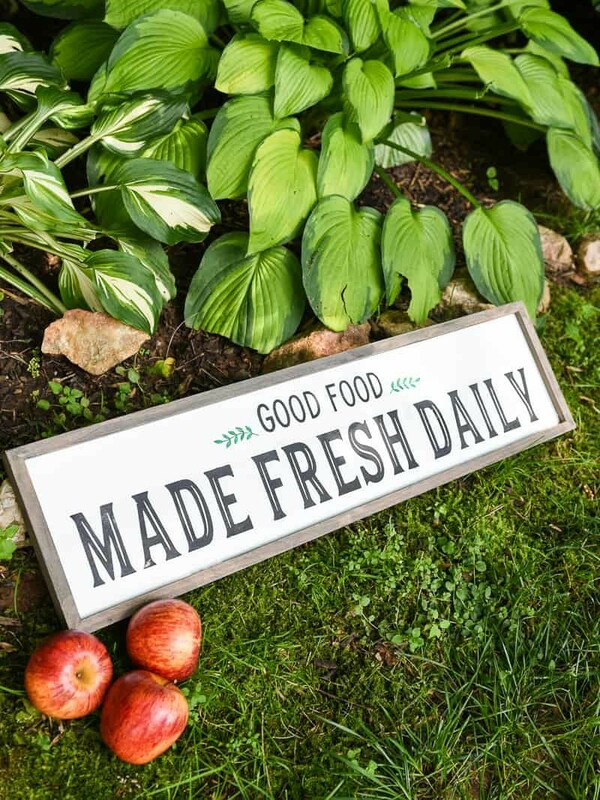 Before we start, download the modern farmhouse kitchen sign file here!+ Cut out the stencil with your cutting machine (there is a PNG file for Cricut users when you click on the link above! PRO TIP: You will be cutting a very long stencil for this project. You do not need a mat to cut, but if you want one you’ll want to buy a 12×24 inch mat. If you decide to NOT use a mat, make sure that your rollers are adjusted so that they hold the stencil vinyl down while it cuts. + Weed your design and then lay transfer tape on top. Pick up your design with the transfer tape and put it on your wood sign. + This step is optional, but you could paint a very light layer of mod podge on top of this stencil. This will help prevent paint from bleeding in the next step. + Next, use a very light layer of paint and go over your stencil. Too much paint will cause bleeding, even with the mod podge! + While the paint is still tacky, pull up your stencil. + Once the paint is dry you can take a piece of sandpaper and distress the design a bit. If you’re not into that look then go ahead and hang your frame because you, my friend, are done! This modern farmhouse kitchen sign is going to hang above the cabinets that are over my oven, and I can’t wait to put it up there! I’m just tall enough to reach (if I’m standing on the counter) so I can do it while Chris is at work. I’m impatient and am ready to get this thing done! And if you’re looking for more farmhouse and rustic decor because you’re obsessed, you might like these! I just love how this turned out! You did such a great job!